Imagine the following scenario: It’s payday and you want to pick up your salary. But first, you have to navigate a series of deteriorating, hazardous dirt roads to get to the bank. It takes you a few days just to talk to a teller. When you finally do, the teller informs you that the bank is currently out of cash – you’ll have to wait some more. 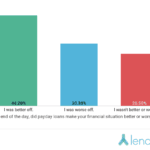 By the time you actually get paid, you’ve had to miss several days of work – and to top it all off, between bank fees (including bribes or unofficial fees to bankers and security guards), the cost of lodging, travel and food, you’ve spent 15 percent of your salary just to pick it up. This had long been the monthly routine for many Liberian civil servants – a situation some memorably described as “Dig a hole just to fill a hole.” More than 90 percent of Liberia’s roads are unpaved. To get to the banks in the city centers, Liberia’s rural populations must make the expensive, dangerous and time-consuming trip over eroding roads. During the rainy season, from April to November, roads can become completely unnavigable, transformed into muddy swamps pocked with massive, water-filled potholes. Adding to this, lines at banks can be hours or even days long, and low liquidity leads to regular cash shortages. All these factors combine to create a situation in which health and education workers can miss anywhere from a day to a week of work to collect their salaries. To address this challenge, the Liberian government has partnered with the Mobile Solutions Technical Assistance and Research (mSTAR) project, led by FHI360 and funded by USAID, to roll out mobile salary payments for Ministry of Education and Ministry of Health workers. With mobile salary payments, these workers no longer need to leave their workplaces to receive their salaries. Since the program launched in 2016, 3,187 education and 803 health workers have enrolled in 14 counties. 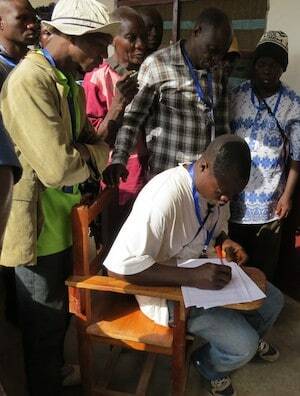 Education workers sign in to a mobile money salary payment enrollment in Lofa County, Liberia. Liberia is new to mobile money, especially in comparison with its well-established counterparts in East Africa. But despite the country’s nascent mobile money ecosystem, digital financial services have begun to take hold. For Liberians in general, mobile money is helping to solve the kinds of banking challenges described above. With mobile money, Liberians go to an agent, whom they often know by name. There is seldom a line, and people are free to go on their own time, unrestricted by bank hours. Since Lonestar MTN, one of the largest mobile network operators in Liberia, debuted its mobile money product in 2011, 1.6 million people have subscribed. For a nation of 4.6 million, that represents significant uptake. Since the beginning of the mSTAR project, Lonestar has partnered with the government to disburse monthly salary payments to enrolled health and education workers. But civil servants covered only by the telecom company, Lonestar, frequently complained about their lack of options, and it quickly became clear that one mobile money provider was not enough. Since Orange Money had launched its mobile money product in February 2016, only a few months before mSTAR began, Orange did not have the national presence required to participate at that time. But it has since grown its agent network and last November, after months of negotiations, the government of Liberia and Orange agreed to terms to allow the government to pay health and education workers via its mobile money service, Orange Money. With most of the country covered by both Lonestar and Orange, the increase in competition will benefit civil servants who are now able to select their provider of choice. Competition can drive down prices and increase service points. 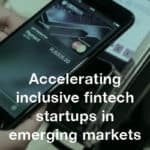 It can also improve aspects of service delivery beyond network coverage and pricing, such as payment product integration, user-friendliness, innovation around new financial products and services to promote financial inclusion, and value-added services such as market and weather information and health messaging. What might this increased competition bring to Liberia? New and diverse products? 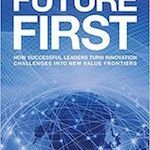 Broader financial inclusion for the population, of which 72 percent are unbanked? There is optimism that this is what the future could bring. In the short-term, it is apparent that Liberia is headed in the right direction. Of health and education workers surveyed, more than 90 percent are satisfied with their mobile salary payments. They have been able to save on average 33 hours and 1,500 Liberian dollars per month in picking up their salaries. “Since I enrolled in mobile money, my life has changed,” one teacher in Bomi County told mSTAR. “Mobile money salary is so sweet and timely and got me shining.” More health and education workers “shining” can only be a good thing. Erica Bustinza is the Chief of Party of mSTAR/Liberia, funded by USAID and led by FHI 360.